Complex regional pain syndrome (CRPS) is a disease that has perplexed clinicians and basic scientists alike, not only for the refractory nature of the condition but also for its protean nature. It can manifest in any given individual, although it is more common in females, and many of its features are difficult to explain on a pathological level. This has led to some clinicians even declaring that the condition is psychosomatic in origin [1, 2]. CRPS clearly presents as a neuropathic pain condition but is mostly singularly unresponsive to oral anti-neuropathic agents (e.g. Gabapentin, Pregabalin). It has classical features that mostly occur after trauma or surgery to a distal limb, and that start in the periphery and ascend to the groin in lower limb cases and to the axilla in upper limb cases, becoming geographically demarcated at these levels. 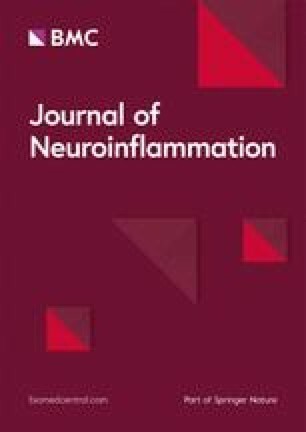 Traditional subtyping of CRPS depends on whether disease onset is associated with a clinically confirmed direct peripheral nerve injury (CRPS type II—previously ‘causalgia’) or without a confirmed nerve injury (CRPS type I—previously ‘reflex sympathetic dystrophy’); however, research indicates that CRPS-I also involves nerve trauma [3, 4, 5]. Regardless of subtype, the pain is disproportionate to the initiating event and is persistent. It is associated with some degree of swelling of the distal limb, colour change, temperature change, sweating change and motor impairment (weakness, tremor, dystonic posture). A ‘CRPS-not otherwise specified’ label may be applied to those few patients in whom some of these symptoms resolve over time but significant pain remains . Whilst CRPS was initially considered a neurological phenomenon, there is accumulating evidence that it is an immunoneurological disorder [7, 8, 9]. Early evidence for this can be found as far back as the 1950s in the response to oral corticosteroid administration in early presentations of the condition (< 6 months) . In most cases, acute CRPS resembles peripheral inflammation. The inflammatory response is excessive in CRPS, and this can have pathological effects on the nervous system and lead to perpetuating inflammation and chronic pain [11, 12, 13]. Multiple individual findings of immune system involvement have been documented. This has included increased expression of pro-inflammatory cytokines in the skin, blood and cerebrospinal fluid of CRPS patients [14, 15, 16, 17, 18, 19]. There is evidence for local neurogenic inflammation, with elevation of neuropeptides, particularly CGRP and Substance P that mediate oedema and inflammation and may lead to an immune mediator cascade [20, 21, 22]. Auto-antibody production has also been implicated, especially involving the muscarinic-2 acetylcholine (M2) receptor, and the α1a and β2 adrenoreceptors [8, 23, 24, 25, 26], whilst elevated plasma levels of soluble IL-2 suggest a possible T lymphocyte-mediated response . A recent review has summarised the auto-inflammatory and auto-immune contributions to CRPS (see ). Flow cytometry has been used to investigate the immune function in CRPS patients with mixed results [29, 30, 31, 32]. 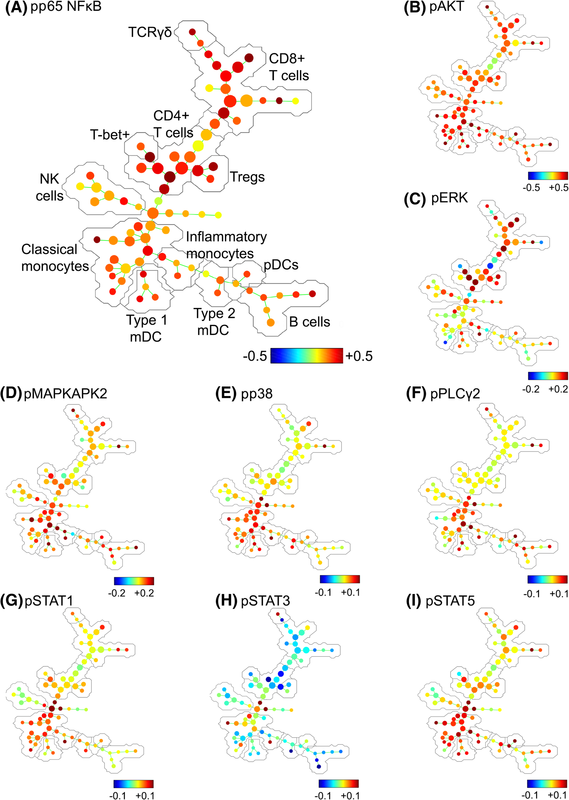 These studies analysed a small subset of immune cell types and did not investigate intracellular signalling. An alternative approach to assess immune function is via mass cytometry, which uses metal isotopes instead of fluorophores as reporters, increasing the multiplexing capacity and allowing a large array of immune cells and intracellular activation markers to be examined concurrently. Mass cytometry is a powerful tool that is allowing for new insights into cell biology and systems function to be gained [33, 34, 35, 36, 37, 38]. Therefore, the current study assessed peripheral blood mononuclear cells (PBMCs) and their intracellular activation status using mass cytometry and systematic unsupervised analysis approaches in chronic (> 6 months) CRPS patients and control subjects. 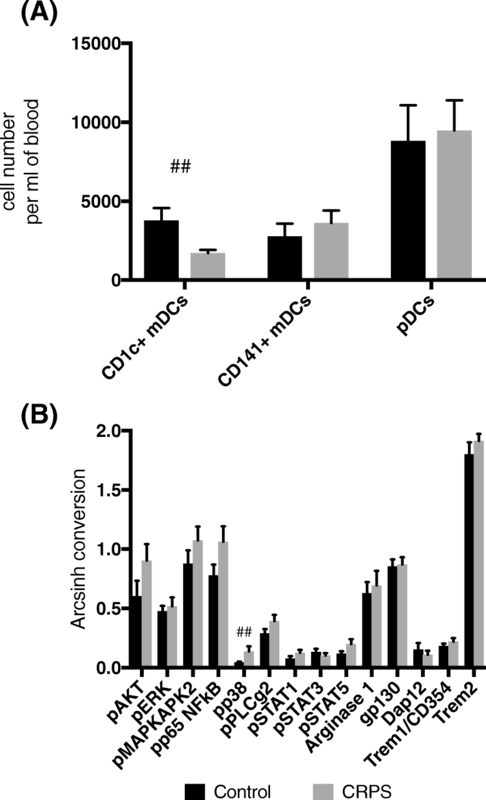 Central memory CD8+ T lymphocytes had increased expression of phosphorylated STAT1 and p65 (NF κ B subunit), as well as increased gp130 expression. NFκB is a critical transcription factor in interferon-gamma (IFNγ) production in CD8+ T lymphocytes , whilst STAT1 signalling mediated by IFNγ regulates clonal expansion and production of memory CD8+ lymphocytes . It is therefore possible that NFκB-IFN γ-STAT1 signalling may be involved in the expansion of central memory T lymphocytes seen in CRPS. gp130 is a common signal transducing component of functional receptor complexes of the IL-6 family, including IL-6, IL-11, leukaemia inhibitory factor (LIF) and ciliary neurotrophic factor (CNTF) . In CD8+ T lymphocytes, IL-6 binding to gp80 leads to the formation of a gp130 homodimer complex that results in activation of STAT3 and consequent effector functions mediated by IFNγ and granzyme B production [53, 54, 55]. CRPS patients have elevated IL-6 in blister fluid and CSF, as well as reduced plasma levels of soluble gp130, that counteracts IL-6 signalling [14, 17, 56, 57]. 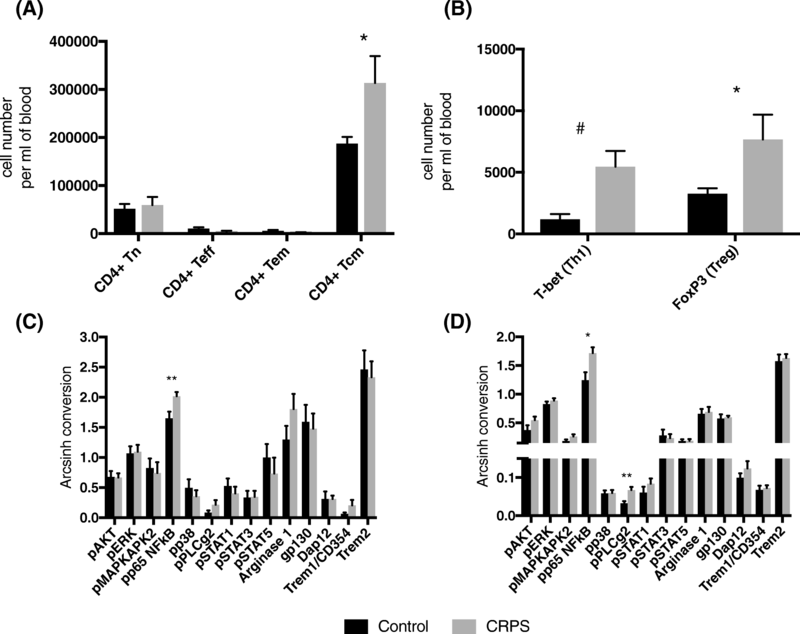 Therefore, it is possible increased gp130 expression by CD8+ lymphocytes may be related to increased IL-6 signalling resulting in effector functions that enhance cellular damage in CRPS. These cell signalling patterns indicate activation of the expanded central memory CD8+ T lymphocyte population and are consistent with their pathogenic role in CRPS. It is believed that in CRPS, on the production of damaged tissue, there is a release of substances such as damage-associated molecular patterns (DAMPS), which activate immature DCs in the skin and tissue [48, 70, 71]. This is supported by evidence of accumulation of dermal resident dendritic cells (i.e. Langerhans cells) in the affected limbs of CRPS patients with severe pain compared to the limbs of non-CRPS affected patients who had recovered from nerve injury, and in the tibial fracture mouse model of CRPS [21, 72]. These cells then become phenotypically mature and translocate from their resident position to the draining lymph node (axilla and groin) where they can activate CD8+ and CD4+ T lymphocytes [73, 74, 75]. Activated CD4+ and CD8+ T lymphocytes contribute to nociceptive signalling and cellular damage through the release of cytokines or direct infiltration into peripheral nerves, dorsal root ganglia and the spinal cord [78, 79]. It is well known that cytokines and immune cells can signal to the brain through neural, humoral and cellular pathways and modulate mood [80, 81]. Although, it is yet to be confirmed whether T lymphocytes migrate to supraspinal sites in CRPS. Despite this, T lymphocytes can indirectly modulate pain processing in critical brain regions through peripheral inflammatory cascades [82, 83, 84]. 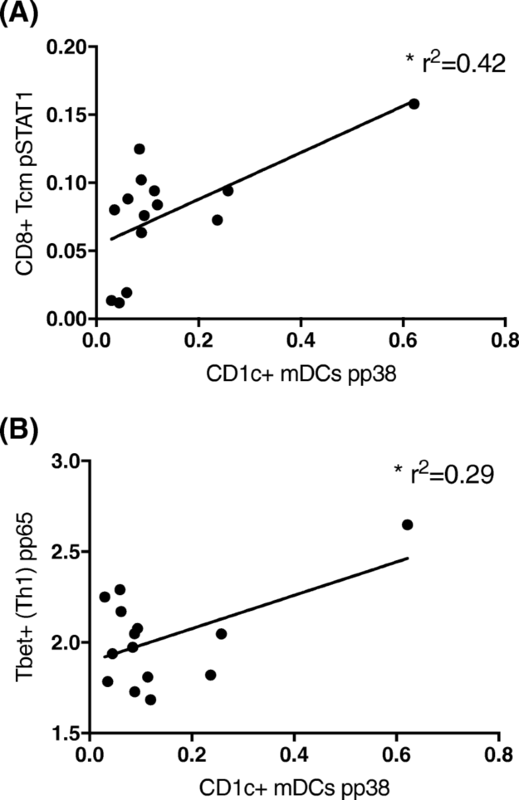 The number of central memory CD8+ T lymphocytes positively correlated with stress scores, whilst the number of Th1 cells and their NFκB signalling negatively correlated with anxiety scores and pain catastrophising, respectively. These results suggest that central memory CD8+ T lymphocyte expansion, rather than Th1 lymphocyte expansion and activation, may drive mood changes in CRPS. 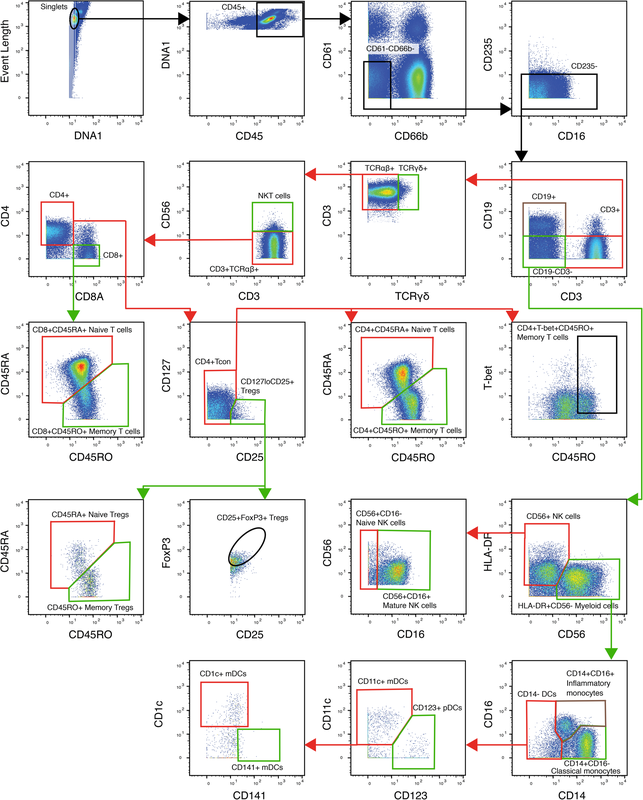 Elevated CD8+ T lymphocytes and decreased CD4+ T lymphocytes have been previously reported in human immunodeficiency virus (HIV) and liver cirrhosis patients with co-morbid depression [85, 86, 87, 88]. Further, plasma levels of the archetypal pro-inflammatory cytokine TNF correlated with depression scores in painful neuropathy . Therefore, our findings provide further evidence that peripheral and central inflammatory cascades may mediate the co-morbidity of pain and depression [44, 82, 84, 90].